Rubber Flooring Proves to be The Safety Magnet for Super Active Kids! The kids that are involved in gymnastics, dance or karate or those who have energy all over them to roll around will enjoy the safety and the comfort of Rubber Flooring. Generally used in schools, hospitals, and in recreational areas, rubber flooring is a durable and safe option that will favor the kids as well the person who is in charge of them at the time. Envisage possessing comfortable floors that your kids enjoy jumping, somersaulting and cartwheeling across, the rubber floors can be installed in the areas where the kids spend most of their time like in the play areas, bedroom or in the family rooms. The Rubber floorings are available in an extended assortment of designs, colors and textures, which means that it won’t trouble you much in finding out the rubber flooring that matches your needs and blends well with your home decor. Along with being slip resistant, the rubber floors are also in nature hypoallergenic. In simpler words, the surface of the flooring resists the allergens like pet dander, dust mites, and general dirt or debris. This does not entail that you can discard your bottoms because the rubber floors need sweeping as well as mopping on a regular basis or just like any other hard floor surface. Rubber flooring also possesses antimicrobial properties that defend it against the fungi and moth growth. However, high humidity that can easily damage the wood flooring with time does not have the same impact on the rubber floors. 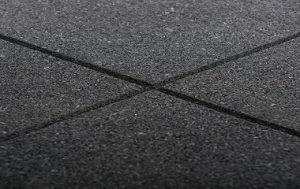 The fascinating and the most interesting thing is that the majority of the rubber floors do not comprise of any volatile organic compounds or VOCs. The VOCs are known for worsening asthma and allergy symptoms when they are realized in the air. In certain cases, the exposure to VOCs in time can also create allergies in children and adult alike. It can also amplify the risk of cancer. To help make sure that your kid’s well being remains intact, select a floor that does not contribute to any toxic indoor pollution. Rubber flooring is sufficiently soft to cushion the falls but is sufficiently hard as well for the task of easy walking. The spring surface of the floor is great for the people with achy joints and for the children who are just learning how to walk. Most of the gymnastic centers employ the use of rubber floors. It is because they can help kids jump higher without the risk of getting injured when they come in contact with the ground. Rubber flooring manages the spills beautifully and resists the stains or any other permanent damage. This flooring is ideal for the people with children who are prone to dropping the cups or bottles. However, remember that pools of liquid can loosen the rubber floors adhesives. Ensure that you mop up any excess water while cleaning to prevent any damage to the surface of the floor. Amazing floors includes all the types of rubber flooring options that come in various colors and variations along with the promise to deliver the ordered product on time.